(Columbus, KY July 30, 2015) - Jenean Hampton grew up in Detroit with her mother and sisters, moving around apartments in the central city. She joined the US Air Force in 1985 and served in the first Gulf War, Desert Storm.. She met her husband, Doyle, when they were both stationed in Oklahoma. Doyle retired from the service. Hampton and her husband moved to Bowling Green Kentucky in 2003. As soon as they moved, they both knew they were "home". Hampton became active in Tea Party politics and was inspired early by another Warren County resident, Dr. Rand Paul. First attending big Tea Party rallies, Hampton soon realized she was missing things back home. She began attending school board and fiscal court meetings. Often she said, there was no one in attendance but her. Her political activity led to a run against long serving Representative Jody Richards. She lost, but she thought she did "pretty well." Her decision to run again for the Legislature was put on hold when Matt Bevin contacted her and asked her to be his running mate. She said yes. 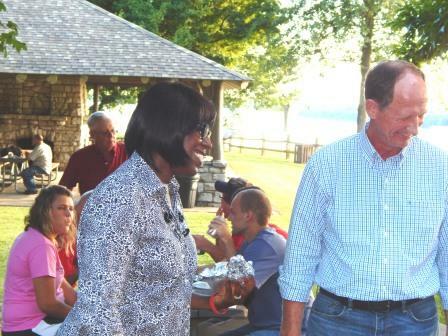 Hampton told a crowd of about 75 Republicans gathered at the second Picnic and Politics in the Park that she is a strong Christian and when Matt called, "I prayed on it." Then she said yes. Hampton didn't indulge in the Democrat bashing of speakers who preceded her and followed her to the podium. She spent her time introducing herself to Jackson Purchase Republicans. She urged them repeatedly to get out the vote. Hampton, at left with 2nd District Rep. Richard Heath, said she is often asked why she is a conservative. She finds to have an insulting underpinning, as if the questioner expects her to be a Democrat because of her race. Her answer? "I saw what Democratic policies did in Detroit. I was nine when the riots happened. I watched people move out. Then Detroit raised taxes. It was a death spiral." With an undergraduate degree in industrial engineering and a masters degree in marketing, she has some idea of what she wants to focus on as lieutenant governor. She wants more entrepreneurial training in the schools from pre-K through college. She wants to promote education at all levels. She also wants to promote a better connection between private business and education. Finally, she wants to be a role model for all ages. Getting her higher degree in her forties, she wants to show there is no certain age to stop learning. Hampton has no state government experience. Her work life has been spent working in the private sector. That mirrors her running mate who also has spent his work life outside of government. When asked if she would be the point person with the General Assembly which gavels into session beginning January 2016, Hampton said she had visited the Legislature once. As far as the upcoming Fancy Farm Picnic, she said she wasn't aware that lieutenant governor candidates gave speeches. Her impression was only the top of the ticket got to address the crowds. Then she got her letter from the committee. Jenean Hampton, candidate for the second spot in Kentucky government is working on her four minute speech. 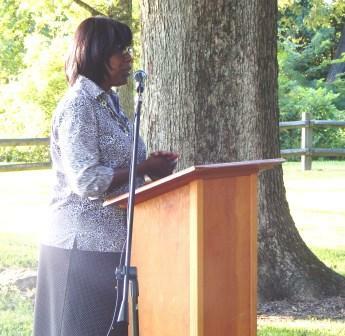 She said that she and the committee thought she would be the first African American woman to speak at Fancy Farm. It will be a historic moment no matter how well the speech is received. The GOP candidate is confident that all will be well.